The hand is a complex structure made up of 29 different bones. 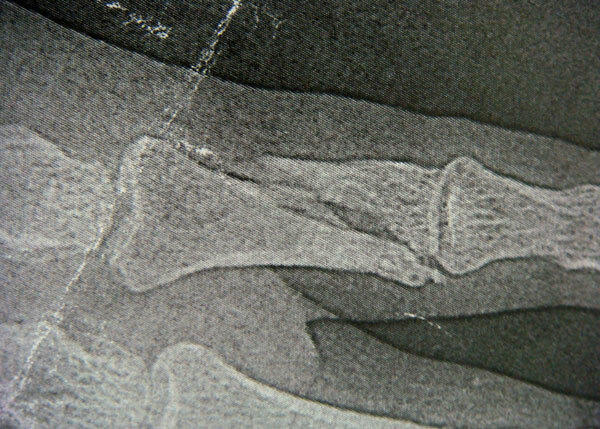 The last bone at the end of the finger is known as the distal phalanx. 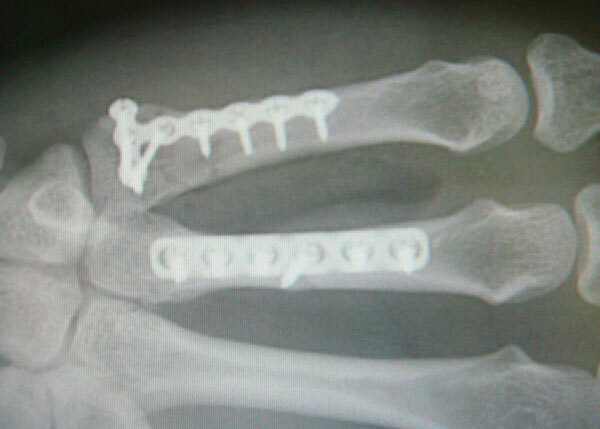 When these bones are broken it is often a crush injury and may be open with nail bed lacerations. Boxer’s fractures of the fifth metacarpal that result from punching usually break just proximal to the third joint of the small finger. These are usually closed factures but may result in serious hand infections if there are cuts over the knuckles from punching the opponent’s teeth. 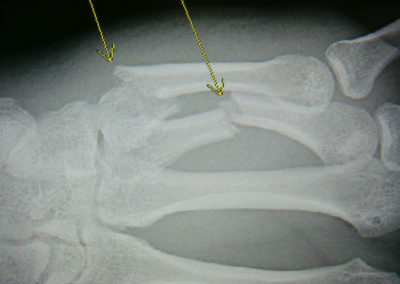 The most commonly fractured of the 8 wrist bones is the scaphoid. It is important for patients to seek medical attention for a hand injury, even if it appears to be minor. Function of the hand relies on the proper alignment of the bones within it, so it is important to determine whether or not those bones have been displaced as a result of the injury. 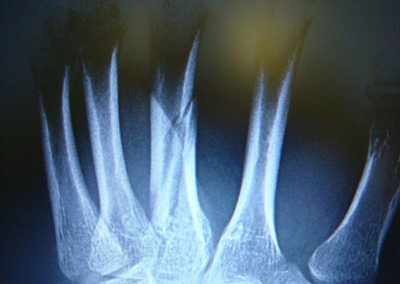 Your doctor can diagnose a hand fracture by physically examining the motion of the hand and position of the fingers but an x-ray is needed to confirm a diagnosis. It is important to seek proper early treatment in order to relieve symptoms and restore movement and function to the hand. Treatment for a hand fracture may be performed through nonsurgical methods that include immobilizing the broken bones in a brace or cast. Patients will be required to wear this for three to six weeks as the bones heal, and may perform hand exercises once it is removed to restore function to the hand. 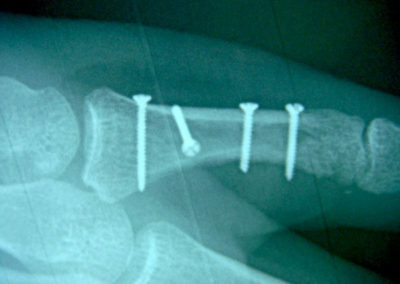 Surgery may be required for severe unstable or misaligned fractures in order to realign the bones, which may require the use of wires, screws, or plates. After surgery, keeping the hand elevated above the heart day and night for the first week not only reduces pain and enhances healing, but also, minimizes swelling and secondary stiffness. Occasionally, hand therapy may be needed to aid in restoring as much movement as possible. For more information on Hand Therapy look here. In some fractures, the process of mending the bone is not as simple as securing the exterior site with an immobilizing cast. The process of open reduction with internal fixation is extremely effective and normally indicated when there is complete separation and instability of a bone fragment. 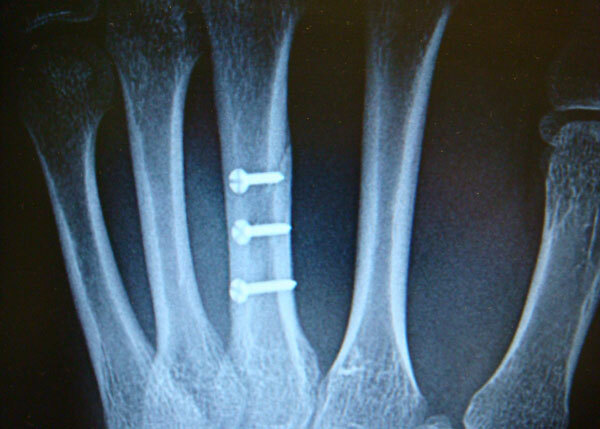 In this procedure, the patient is surgically operated on in order to set the bones in their place while screws, wires, and/or plates are utilized to stabilize them beneath the skin, reduce pain, and augment the healing process. Open Reduction Internal Fixation is commonly used to treat fractures of the wrist, forearm, and hand in order to restore function of these essential bones and allow patients to once again perform everyday tasks. 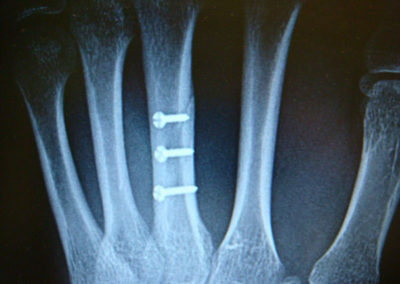 The surgical hardware used during this treatment is often left in the bone permanently, as long as no symptoms arise. Early movement is possible with internal fixation of the unstable bone. For more information on Hand Fractures CLICK HERE.